At more than 1,000 years old, Hanoi is one of Asia’s oldest cities—the street food mecca teems with sidewalk life, and pedestrian walkways are more suggestive than heeded. Diners spill onto sidewalks littered with tiny plastic stools in every color of the rainbow, and the streets are alive with the sounds of zooming motorbikes and the clamor of pots and pans as vendors sling bowls of noodles and sizzle grilled meats. A stroll through the labyrinth-like alleys can easily become a food tour, as restaurants pop up left and right in the form of makeshift storefronts. From northern-style pho (not as sweet or fishy as Saigon pho) to bun cha (grilled pork), the food of Hanoi has long been celebrated around the world, with chef’s such as the late Anthony Bourdain praising it as one of their favourite food cities in the world. There is no shortage of pho shops dishing out versions of Vietnam’s de facto national dish, but Pho Gia Truyen stands out as being one of the best with its expertly judged broth, light and bouncy rice noodles, and tender pieces of brisket. It’s not uncommon for the noodle soup to sell out shortly after midday, which means that you have to get there early—7:00 in the morning kind of early. In Vietnam, pho is commonly eaten as a breakfast food, as the delicately spiced soup is restorative, awakening senses and setting the stage for a good day. As you make your way to the front of the queue, you’ll find yourself standing in front of a workstation manned by cooks who dip noodles into piping hot broth before slicing pieces of meat off hunks of brisket right in front of you. It’s very likely that you’ll be confused when it’s your turn to order, as there’s no signage and the clientele is largely local. Fear not, there really are only two items on the menu: pho with either cooked or raw beef. Don’t expect a comfortable dining setting, as tables are communal and low to the ground, so be prepared for some squatting action and beads of sweat during the hot summer months. Visiting Hanoi and not indulging in street-side bun cha (barbecued pork with rice vermicelli) and nem cua be (fried crab spring rolls) may as well be classified as a capital offense. The quintessential Hanoi specialty is famously served at Bun Cha 34, a restaurant that should come with a warning sign because once you have a bowl, you’ll itch for more. Bun cha is essentially a smoky barbecued pork patty marinated or minced with garlic, shallots, and fish sauce, enjoyed with vermicelli noodles, fresh mint, coriander, lettuce and pickles. The pork is served in a bowl of herb-laden, slightly acidic broth that cuts through the porkiness of the patties. The restaurant owners are a no-nonsense bunch who run a very tight ship—as soon as you sit down, a menu is slapped onto the table in front of you and you’ll be expected to order soon after. Portions are fairly large and can be shared between two people, especially if you get some crispy, golden spring rolls on the side. Remnants of French colonialism can be found at Bánh Mỳ Sốt Vang Hàng Bông, where crispy loaves of baguette-esque banh mi is served with a thin beef stew that’s similar to boeuf au vin or boeuf bourguignon but adapted for the Vietnamese palate. Instead of western herbs like parsley, rosemary and thyme, sốt vang is made with warm spices like cinnamon, star anise and cardamom. Diners sit on short plastic stools while hovering over metal trays of bread and stew and cups of soya bean milk. If you’re feeling up for it, order a side plate of pâté, luncheon meat, cucumbers and egg doused in a secret sauce to go with your dipping stew. Locals know this shop by a number of names: Banh My Sot Vang Hang Bong, Banh My Sot Vang Cua Nam, or Banh My Sot Vang Dinh Ngang all fly, but its official name is Qua Tang Thien Su. Its varied names can be explained by its location at the intersection of Hang Bong, Cua Nam and Dinh Ngang streets. Walk down any street in Vietnam, and it’ll quickly become apparent that the country runs on caffeine. It’s not uncommon to see people sipping on coffee while squatting on low plastic stools. At Cafe Giang, you can forget about the skinny lattes. People flock to this popular coffee shop in search of "cà phê trúng," or egg coffee, a Hanoi speciality in which dense Vietnamese coffee is topped with a meringue-like egg white and sweetened condensed milk foam. The rich beverage can be enjoyed hot and cold, and tastes almost like a coffee-flavoured dessert. The drink was invented at Cafe Giang shortly after 1946, when a shortage of fresh milk inspired owner Tri Hoa Nguyen’s father to whisk eggs into his coffee as a substitute. Located down a narrow alley in the Old Quarter, Cafe Giang sits hidden on the first floor of a charming building that blends both Eastern and Western architecture, and with its low wooden tables and gallery walls, the old school cafe is a true Communist-era throwback. This quiet balcony oasis is a pleasant retreat from the hustle and bustle of Hanoi. Located on the fifth and sixth floors of a building in downtown Hanoi overlooking the Hoàn Kiem Lake, Cao Go is a modern blast from the past—antique fans, distressed French shutters and black and white photos of old Hanoi are juxtaposed by mod couches and a contemporary wooden ceiling. Even the leather-bound menu opens with the words, ‘An invitation to the past’. 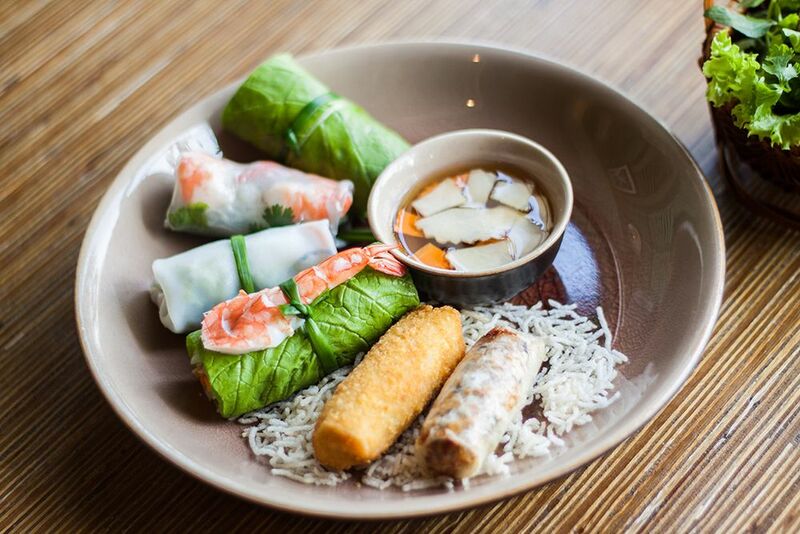 The food is home-style Vietnamese cuisine that draws upon flavours from across the country, prepared with high-quality ingredients. Some must-try dishes include rolled fresh rice paper with barbecue pork belly, shrimp cakes, caramelised black pepper pork spare ribs, and stewed beef shank. When it first opened its doors in 2014, Cao Go was one of the city’s first contemporary restaurants and has since earned itself a stellar reputation. Reservations are recommended, and can be made online or by calling the restaurant. Some say that the Old Quarter Night Market is one of the most exciting markets in Vietnam. Taking place on Friday, Saturday and Sunday from 6 pm to 11 pm, the lively weekend market sells anything and everything from clothes to hats, scarves, bags, ceramics, cosmetics, handicrafts and food. There is no shortage of street eats and snacks at this market; skewered meats in all shapes and sizes, every frittered vegetable imaginable, frozen treats and fresh fruits and vegetables. The pedestrian market stretches around 3km from Hang Dao street to Hang Giay Street, and is always open and filled with people, rain or shine. Your best bet is to get there on the earlier side, especially if you plan to arrive by car, as traffic surrounding the market tends to picks up quickly deeper into the night. Like in all busy streets around the world, be sure to keep an eye on your belongings to avoid pickpockets. O Mai, assorted salted and sugared dried fruits, are a specialty from Hanoi, and are popularly purchased by locals from outside regions when visiting the city. They were originally used as a remedy for sore throats in traditional Vietnamese medicine, but nowadays, they are enjoyed as everyday treats as well as souvenirs. The fruits are seasoned with sugar, ginger, salt, chili and licorice and often displayed in large glass jars before being individually packaged based on weight. While apricots are the star of Hanoi, preserved kumquats, plums, dates and jackfruit are also great options to bring home to friends and family. O Mai can be stored and kept for an extended period of time, making them a perfect gift to take on a plane.